> Symantec > Security Automation: Security Nirvana or Just a Fad? 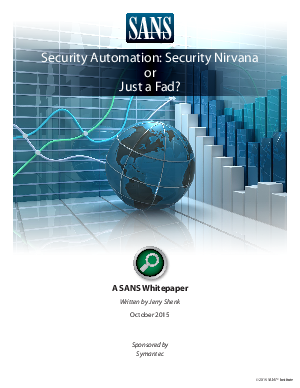 Security Automation: Security Nirvana or Just a Fad? IT departments are struggling to cope with the increasing number of security breaches, investigating too many false positives, juggling too many disparate tools - all while coping with manual processes and inadequate staffing. Organizations need a better way to correlate the data from the external and internal threat intelligence sources. In this whitepaper, learn how security automation can help organizations react quickly to identify and address their most severe incidents before it’s too late.